Happy Sunday!! It’s my all-time favorite day. You can sleep in, still have alcohol mimosas at brunch and laying on the couch all day is completely acceptable. This weekend was a great one. It was extremely relaxing – Friday night, I stayed home alone watching T.V. and going to sleep early. It was glorious. Saturday, I woke up, hung out with the man and then met a friend to run 7 miles! (More on that later). 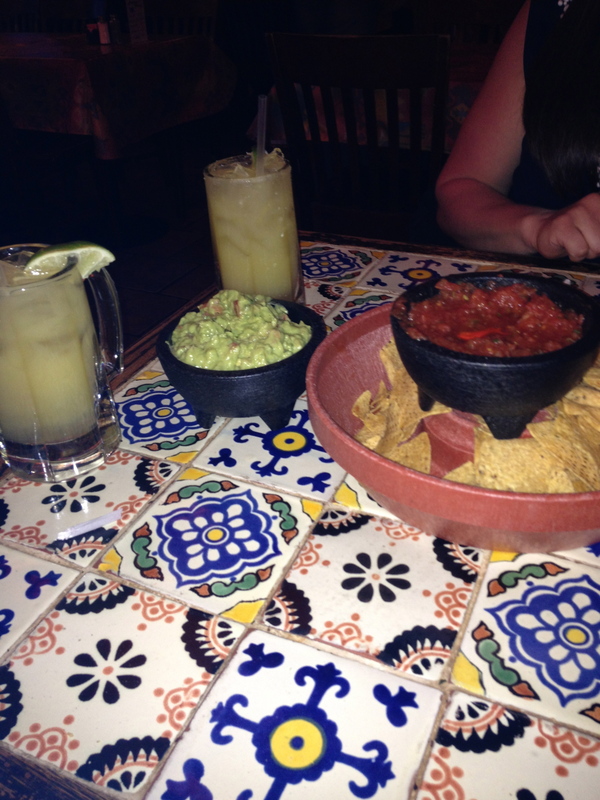 Then we went to grab margaritas! Absolutely wonderful. FRIDAY – The beginning of the weekend was great. Work was pretty good, I ate some good eats and cleaned out the DVR. 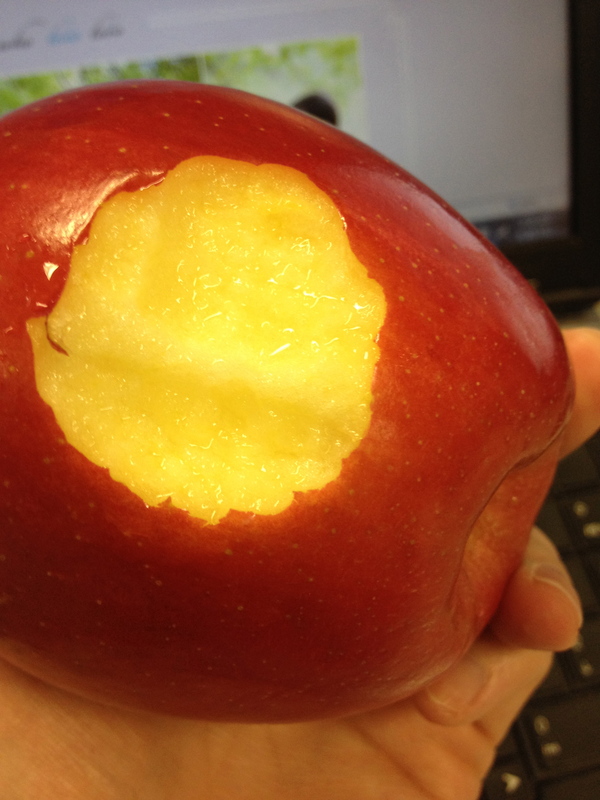 Breakfast was an apple. 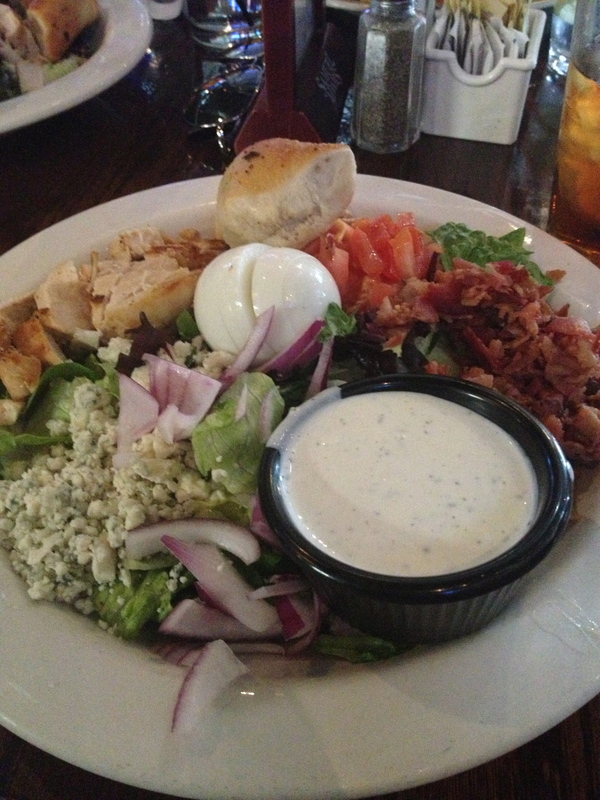 Lunch was a chopped salad with ranch dressing. It was amazing. The next picture is of my open sunroof. 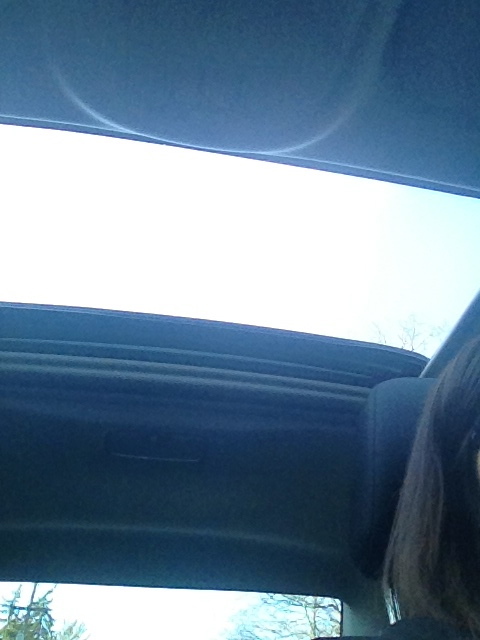 The first open sunroof of 2013!! 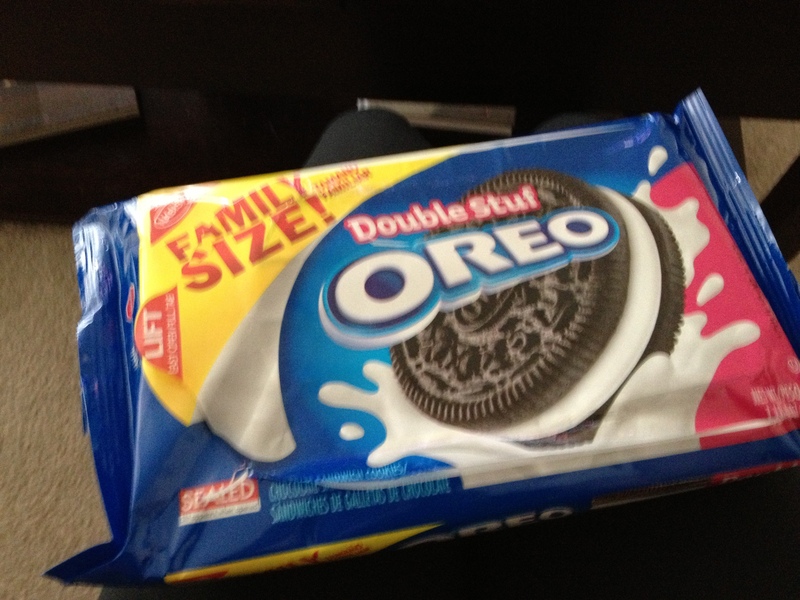 Oh, then I had a few Oreo’s. 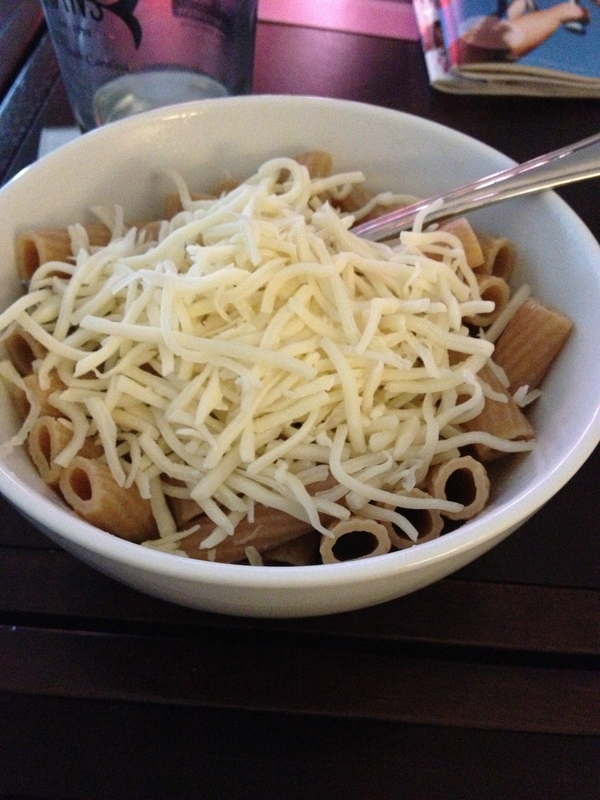 For dinner, I had whole wheat rigatoni with butter and shredded mozzarella cheese. 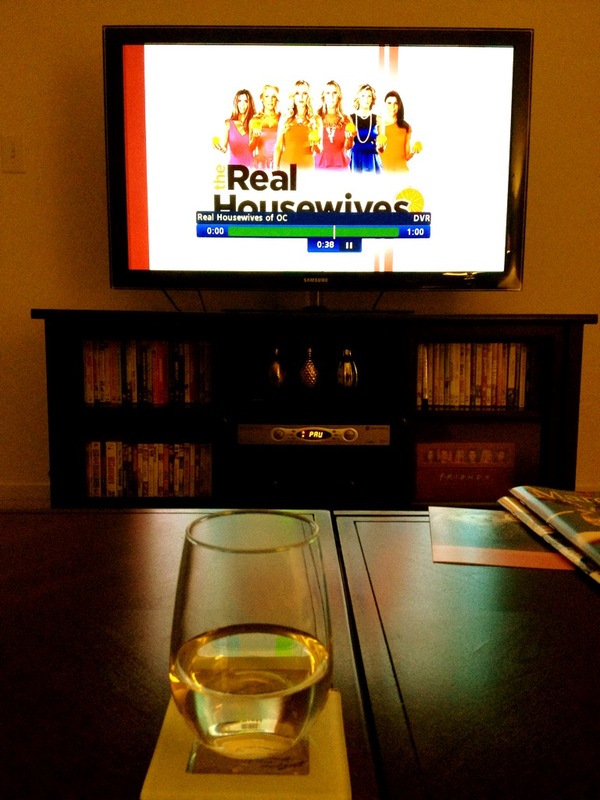 I spent my Friday night watching some of my favorite Bravo shows over a glass of white wine. 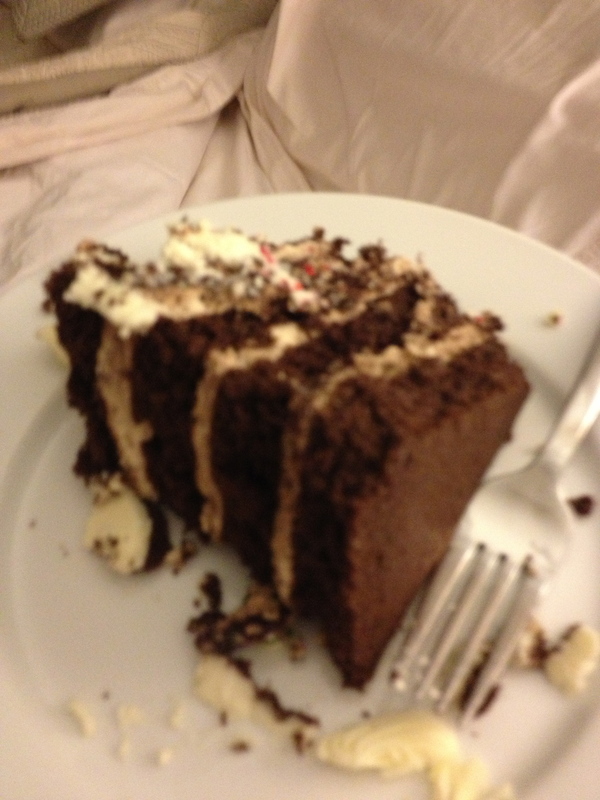 For dessert, I had the last piece of cake in bed. What is it about eating food in bed that is so delicious? SATURDAY – What a great day Saturday was! Not only was it gorgeous weather, delicious margaritas were devoured. 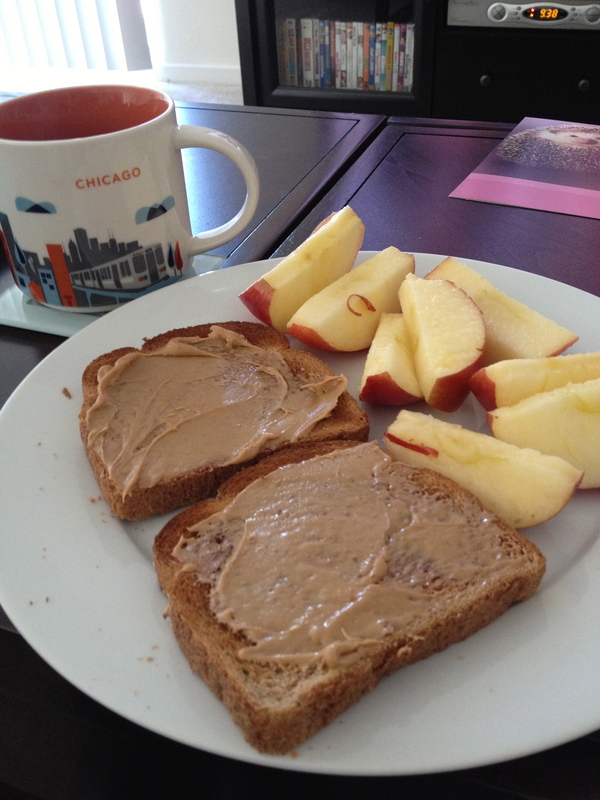 For breakfast, I had 2 pieces of whole wheat toast with peanut butter, an apple and hazelnut coffee. 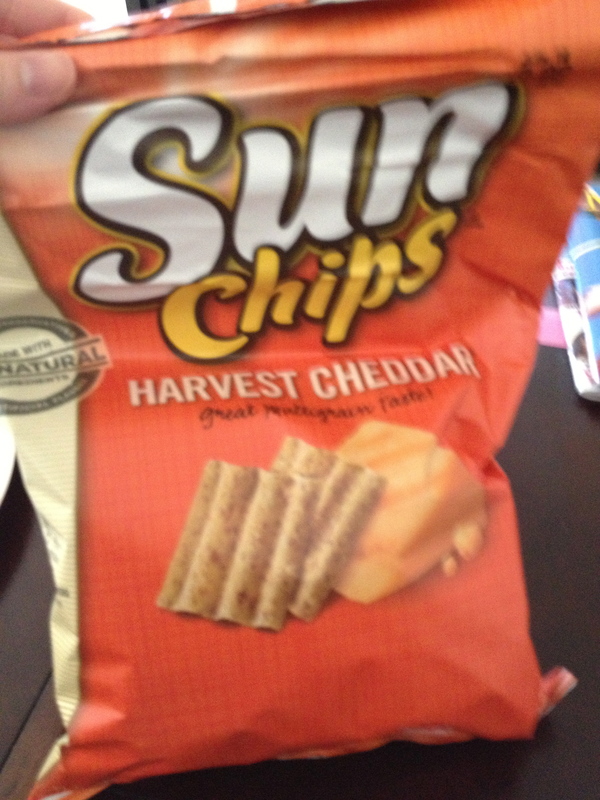 Then I had some Sun Chips! 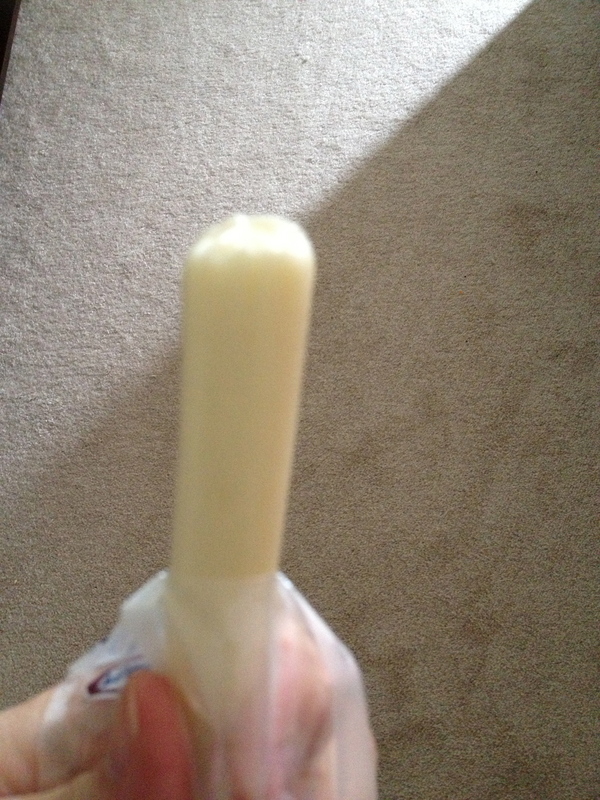 For a pre-run snack, I had a mozzarella cheese stick. Dinner after the run was chips and guacamole, Georgia Peach margaritas and I split my entree with a friend. 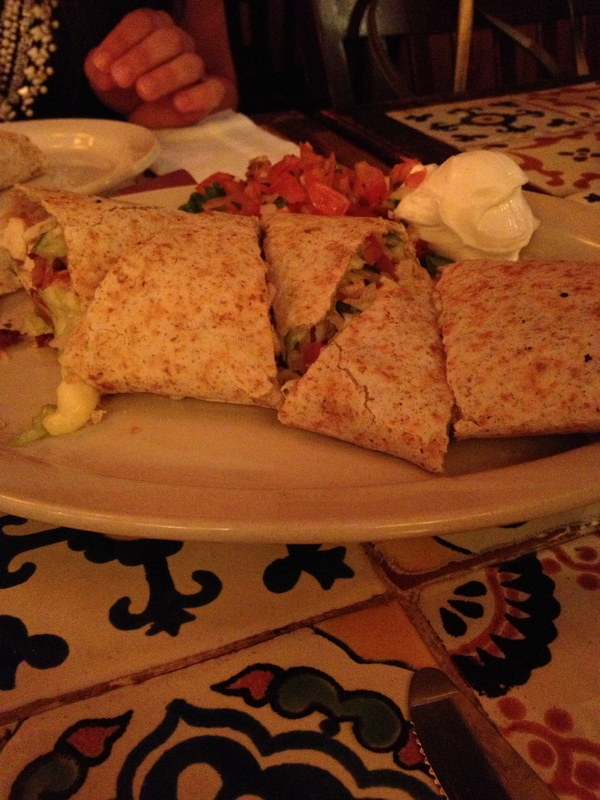 It was a quesadilla with chicken, bacon, cheese and avocado, which was then covered with sour cream. It was delicious and I’m so glad we split it!! 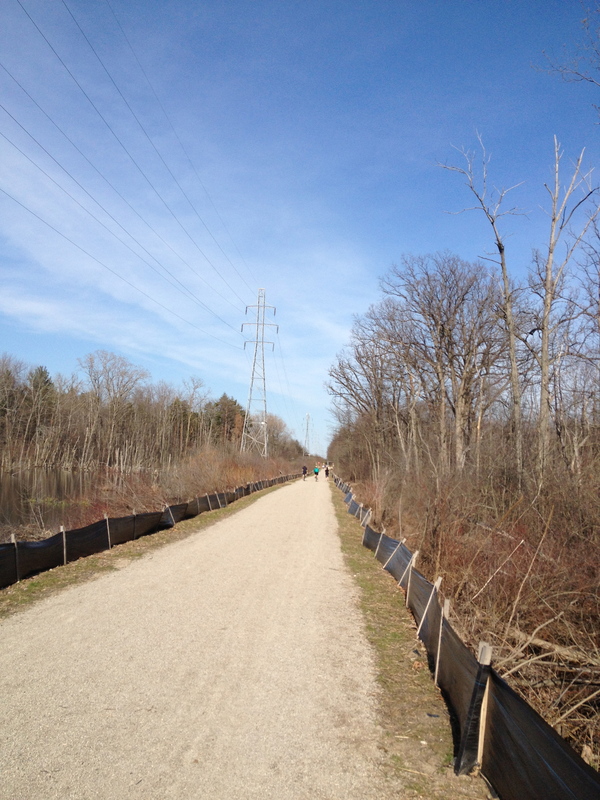 THE RUN – I was supposed to run 7 miles on Saturday, which is what we did. 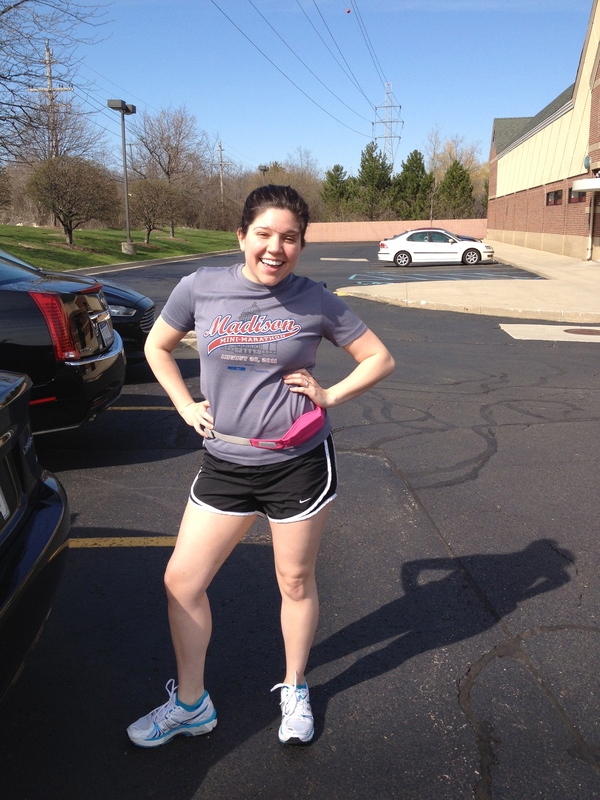 I swung by a running store to pick up some Gu and a nice running fanny pack! I had a chocolate Gu on the run, which was amazing. I also grabbed a Gatorade because I don’t think I drank enough water before hand. I like my fanny pack. It’s pink! I learned a lot of things on my run yesterday. It was 70 degrees – that is too hot for my body. I’ve fainted 3 times in my life, 2 of which were because I got overheated during exercise. I really need to watch how I feel while I exercise. I could feel myself getting hot if there wasn’t a breeze, so I ran pretty slowly. I need to practice hills! There were some step hills on the run and I walked up those hills because I was exhausted and hot. That was the only walking I did, but I need to build up my endurance for the race! I can’t carry anything while running. I put my Gu and car keys in my new fanny pack, but I held the Gatorade in my hand. It was surprisingly heavy. So, note to self: I really need to drink about 3 times more water during the day when I have to run that far. I can finish anything if I put my mind to it. Even though I was insanely tired and hot, I finished the run! It took me a total of 1:21:30, which is about 11:39 average pace. This pace isn’t horrible since I walked up the hills. I would say my average running pace was 10:24, which is a little slower than my goal for race day. I’m proud of myself for running that far and not giving up and turning around. That’s all that matters. I’m a little sore today, mostly in my knees and shoulders – I’m sure that means I was running with my shoulders up . Now it’s time to relax before heading to the grocery store. This entry was posted in breakfast, meals, Training, Uncategorized and tagged Chicago Women's Half Marathon, running, training. Bookmark the permalink.